I got into this topic while looking for a replacement for my 10 year old LCD projector and at the urging of a friend in a similar situation. So I decided to publish my research just for grins. Here goes. The three dominant current digital projector technologies are LCD, DLP, and LCoS. LCD is Liquid Crystal Display, DLP is Digital Light Processing, and LCoS is Liquid Crystal on Silicon. LCD uses prism beam-splitters to pass RGB light through liquid crystal arrays forming an image. These channels are then optically recombined. DLP uses a single chip containing movable micro-mirrors and a color wheel to produce a reflected image without the need for beam splitting. LCoS uses beam splitters and three chips like LCD but reflected light like DLP with a stationary fixed larger mirror for each chip. DLP is hot at the moment, but the target market is primarily home video. It is cheaper to build than LCD or LCoS. It can be smaller and lighter as well. Thus it is also attractive for portable business presentation projectors. But it can be subject to rainbow and halo effects, very visible with still images. This is less of a problem with motion video. If you opt for a better quality, three-chip DLP model, the price and weight advantages quickly fade. LCD projectors use directly transmitted light so they are generally brighter than DLP or LCoS at the same lumen ratings. DLP and LCoS both use reflected light (mirrors) though the mirror construction varies. LCD projectors have been around for a while, but they are generally lower resolutions. LCoS generally offers higher resolutions making it ideal for high quality photographic projections. The native resolution of a projector is defined by the number of pixels in the electronic chip or chips that form the image. The supported resolutions describe the input sources and may be higher than the native resolution. Whatever display (input) resolutions it supports will be resampled to the native resolution. The resolution requirements may be very different for home theater video, business presentations, and photography. For digital photography projections, resolution is of paramount importance. The native resolution may be expressed as screen pixels or video vertical lines. Some will refer to familiar 4:3 computer display aspect ratios and some will refer to HDTV 16:9 aspect ratios. Be aware that most SLR camera images are captured at a 3:2 aspect ratio. Some common monitor terms used here could be SVGA (800x600), XGA (1024x768), SXGA (1280x1024), and UXGA (1600x1200). The DLP models frequently refer to the video vertical resolution only. This might be 480p (NTSC), 720p (HDTV), or 1080p (HDTV). A "p" or "i" designation is for progressive or interlaced video scanning. It will affect video bandwidth requirements but it has insignificant effect on digital still images. Beyond this, it can quickly get into voodoo technology. 720p would be close to XGA. 1080p would most closely correspond to an SXGA monitor or WXGA at 1920x1080. But the 1080p resolution may only be supported from an HDMI video source or broadcast signal. Suffice it to say that most projectors in the $1000 range will be XGA resolution or less. This is 0.7 MP. The best digital projectors get to 2 or 3 MP. With DSLR cameras 6 MP is common. The 35mm slide film equivalent is around 12 MP. Just a perspective on why slide film projectors still rock. Obviously digital projectors can and do offer good image quality. But many are better at video or business presentations than they are for critical photographic evaluation. The extremely high contrast ratios offered by many projectors far exceed the requirements of typical photographic work. Of course, resolution and contrast are both important factors in image sharpness but there are few projectors where contrast is a limiting factor. To put this into perspective, most professional DSLR cameras can capture about 8 f/stops, 48 DB, or a contrast ratio of 256:1. A few high-end medium format digital backs are rated at 12 f/stops, 72 DB, or a contrast ratio of 4000:1. On the other hand, your clients are usually more interested is selecting a pose and rejecting the image with aunt Edna’s eyes closed than anything else. But for critical comparisons and that wow factor, resolution can be important. Most video cards are only going to offer VGA and/or DVI cable connections. Note that there are multiple DVI standards. Some high-end devices will offer RGB (BNC) connections. Some will also offer RCA or S-Video (both NTSC) output. Also note that composite video may refer to three RCA plugs or simply VGA connections. For HD DLP HDMI connections you would most likely need a gender bender (black box) to adapt the signal from a DVI out connector. FYI, the HDMI connector looks more like a USB port than a video connector. This black box is not cheap. RCA and S-Video connections should be avoided as they are very low resolution (852x480). If available, the DVI connection is best. The summary is to make sure that your computer(s) will connect to the projector. LCD is more light efficient so at the same lumen rating the image will be brighter with more saturated colors than DLP or LCoS. Unless you are in a hotel ballroom 1500-2000 lumens will probably be more than you need. LCoS units are typically larger, heavier, and the replacement lamps are more expensive with a shorter life. In summary, anything above the 1024x768 (XGA) resolution quickly breaks out of the $1000 price barrier. Expect to pay $3,000 to $6,000 for higher resolution. An LCoS projector at 1920x1080 priced out above $7500. An LCD projector at 1600x1200 priced out above $26,000. These are in the same price league with the high-end home theater DLP 1080p projectors. This is 3Q 2006. Hopefully the price/quality curve will become more affordable in the future. 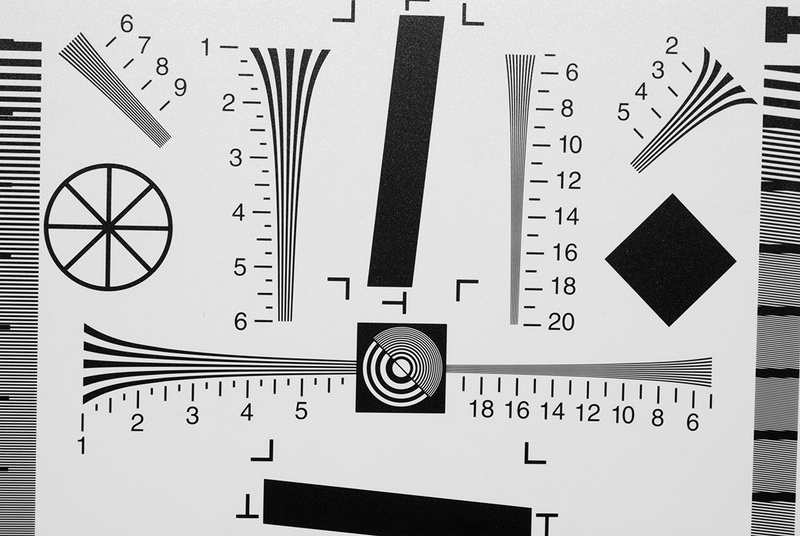 For color calibration, most projectors offer some basic controls over RGB. With a test target image you should be able to visually calibrate this to some degree. ColorVision has recently offered a Spyder2 colorimeter (with software) specifically for projector calibration. You set it up on a light stand in front of the projector screen and run it very similar to a typical monitor calibration. It is most useful where you have dual monitor support so you can create one profile for your monitor and another for the projector. 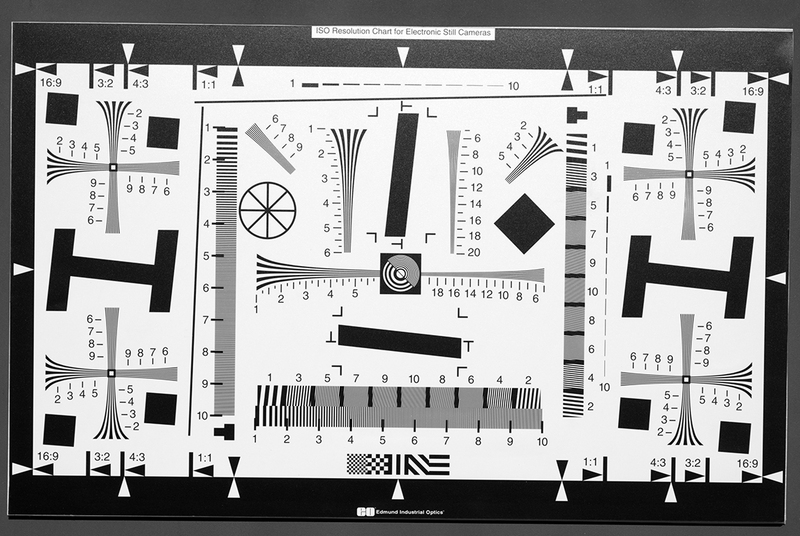 DisplayMate also offers projector evaluation targets and calibration utilities. And DVD International offers Digital Video Essentials. For my own evaluation I created four test images that I can use with my laptop compare projected images in the retail store. One is an image of a GretagMacbeth 24 patch color checker test target. It is easy to display and evaluate the color differences between your screen and the projected image. Any differences will be easy to recognize. 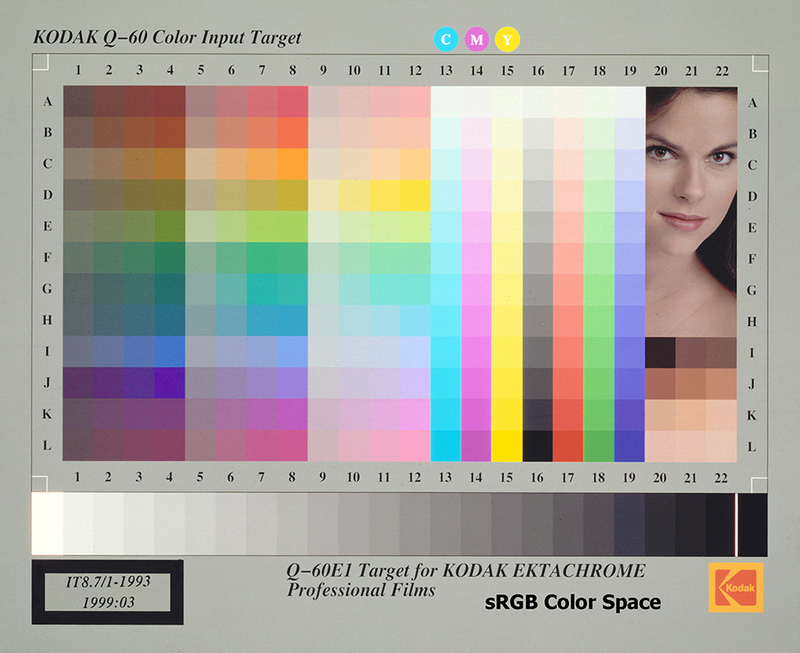 The second is an image of a Kodak Q-60E1 target. It is especially useful for evaluating skin tones and contrast scaling. The third is a high-resolution image of an ISO-12233 resolution target. This was shot with a Nikon D200 (10MP). The fourth is the same target but shot a little closer. I converted both to gray scale and back to RGB to remove any potential color artifacts. Admittedly, this is not the most scientific resolution test. But it works very well for side-by-side projector comparisons. The markings identify the resolution of the paper target in line pairs per millimeter (lp/mm). At the shooting distance I used, problems start at about 14 lp/mm in the captured full image. The close-up shot exceeds the 20 lp/mm max on the target. The numbers themselves are not important. What you want to look for is the problem areas when displayed at the same resolution on two different projectors. Display one of these images on your screen at 100% (actual pixels) and compare your computer's screen to the projection screen. In my own tests I could clearly see the rainbow artifacts with a sampled DLP projector. A similarly priced LCoS projector clearly illustrated the higher resolution and lack of artifacts. These images can be downloaded in a ZIP file here: ProjectorTestImages.zip. This is a 12 MB file. 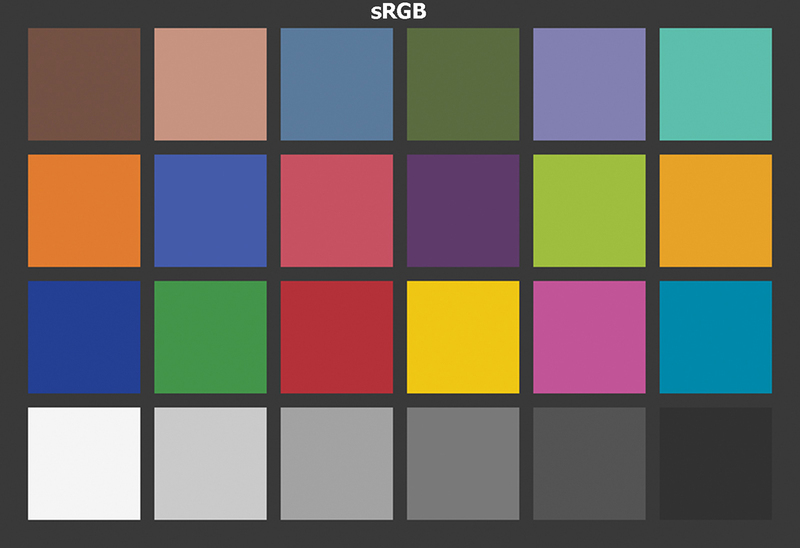 All images are high quality, full sized JPGs in the sRGB color space, so they display the same even with non-color managed applications such as your typical browser. These do not provide a truly scientifically precise calibration. But they can be used for a quick KISS comparison of projectors before you buy. Display the resolution targets at 100% (actual pixels) on your monitor. Pan the image and compare the monitor to the projector. And the color targets can be used for a quick aesthetic color calibration before a presentation using a projector provided by your host. Simply use the projector’s RGB controls to achieve something that more closely matches your screen display. My primary goal is to suggest a technique for evaluation. Not to recommend a specific projector brand or model. Also, to remind the reader that the requirements for digital still images, home video, and business graphics may be different. And hopefully to clarify some of the differences between the base technologies. Other factors to consider include color depth, lamp life, lamp cost, screen distance, zoom range, inputs supported, and the setup menus and calibration controls. If your major consideration is price constraints, I hope this article will encourage you to at least try before you buy.